S&S Welding has built a reputation for providing high quality products and unsurpassed service. S&S Welding Inc. has supplied Aerospace tooling for Aerospace Industry customers such as Boeing, Pacific Aerospace, SpaceX and more. S&S Welding large scale and complex fabrication division utilizes modern, state-of-the-art equipment and employs some of the regions most experienced and talented workforce. Our full-service CNC fabrication capability includes Laser Cutting, Brake Forming, Pipe and Angle Rolling, Plate Rolling, Mandrel Tube Bending, Shearing, Vibratory Deburring, Time Saving and HE&M Sawing. 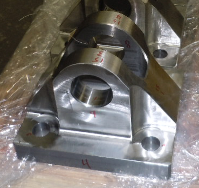 S&S Welding Inc is a World Class supplier of machined parts and complex assembly work. We have the manufacturing experience, tools and knowledge to produce product from simple details to complete kitted assemblies. Our progressive shop culture consistently provides a high value add + low risk solution to meet customer requirements. The entire process from sending the change documents to your offices for review and supplied quote, down to receiving the rails was seamless. © Copyright 2016 S&S Welding. All rights reserved.